Looking at these makes me so happy - I'm not sure if it's because some of these are nearly identical or what, but isn't it exciting?! I think by far my favorite dupe has to be these Rebecca Minkoff sandals which are SO insanely similar to the $945 Valentino Rockstud Gladiator sandals. One day, I'll own ALL the Valentino in the world but until then, Rebecca Minkoff definitely created the perfect dupe! Sunglasses are pretty easy to find dupes for; I tend to buy a few cheaper pairs in the summer because I hate worrying about loosing them on vacation or at the beach. Having a couple of nicer pairs of sunnies can be worth the price but it's amazing how similar some of these are - like these $12 BP sunnies - yes, $12!!! - that are nearly identical to these $400 Jimmy Choo sunnies. The same goes for diamond earrings; I love wearing them, but I'm always worried about loosing them and since I wear earrings everywhere I go, having a cheaper pair to wear is great. These hoops are my favorite, they're light and they really do look real! Diamonds are undoubtedly a girls best friend, so having a real and more expensive staple pair that you'll have forever makes sense but for every day wear, I definitely gravitate toward the dupes! Can we talk about this ELF palette for a minute?! It's literally less than $5, gives long lasting wear, looks natural AND it's almost identical to the NARS blush/bronzer palette! I can't believe what an awesome dupe this one is, I use my ELF duo palette nearly every day and I'm so glad I didn't splurge on the NARS one because even though I do love the brand, I love ELF just as much and they have awesome beauty products! What are your favorite dupes? I am loving my ELF products too. It can totally stand up to expensive big brand names. I've been wanting some tassel earrings but no way I'm going to pay $400 for them! Loved your comparisons for these products! It's always fun to find a product for less that is similar to a pricey one. I too like ELF makeup products. Yes girl!!! I love save or splurges!! That tassel back dress, great find. I love to save money any way I can!! Splurges for me can be so far and few in between so I try to plan them out. Elf products are amazing and I refuse to buy anything else! I have never used elf products but all make up is the same to me lol! I love that beach cover! What a fun post! I love that tassel dress so much! That ELF palette is a total steal! I LOVE save/splurge posts! it is crazy how there truly is a dupe for everything! Love this post, I'm always up for a bargain! I am a total saver. But sometimes I have to splurge a bit too. I love everything you chose, you have great taste. That dress is amazing! The price difference is so unreal. Wow the price difference are crazy. It makes me made to see company charge so much for merchandise. I love checking out saves vs. splurges because it is fun to see how you can create the same look for a whole lot less. I don't understand why people pay more for a name when you can get the same look for less. I love posts like these. They make shopping for a deal so much easier! I love that tassel back dress. I love posts like this!! SO fun to find deals!! Can I just say that I like the look of most of the "save" items better? Awesome job!! I am loving this list!! I really like that top! Very nice! I love the striped tunic, so cute! I have loved the ELF blush/bronzer duo for years. You really can't beat the quality for the price! Great comparison, just look at that price difference! You should do more post like this! Wow they look almost identical and what a savings! Who doesn't love saving money? 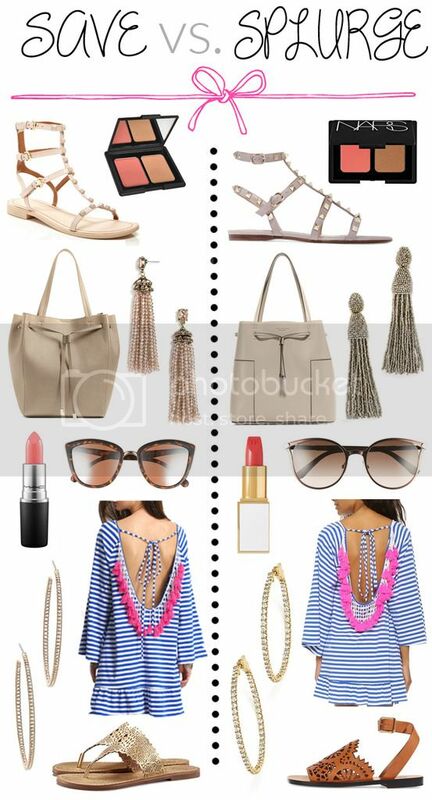 These are awesome duplicate or almost duplicate summer items and I love the idea of the save-vs-splurge post. It is always nice to find the duplicate items that are cheaper than buying the more expensive items. Both the pairs of sandals and the sunglasses are my favorite dupes. Thanks for sharing the save-vs-splurge post. Great post! I buy a few pairs of the cheaper glasses as well just in case I lose a pair. What an awesome round-up. I love save vs. splurge posts. I have that ELF bronzer/blush and it is out of this world. Crazy how it's under $5! This is a fantastic list of save/splurge! Thanks for the heads up on the deal on the cute beach coverup!! I truly appreciate these kinds of posts. Most bloggers, dont ever have shopable options so I love when they do these. I've seen that tassel dress everywhere this summer. So cute. WOW! Sooo many great dupes! These are spot on! I can't believe how almost identical all those items are and how much you can save just by doing a little around. I love those diamond hoops and for only $60 they are a great deal. Great finds! I'm a huge fan of ELF and I've gotta have that pallet! I'm sold on that Tassel sundress. This is a great steals post, thanks. I love the side-by-side comparison! It's so easy to find comparable, and great quality, products so you don't have to spend a fortune. WOW! What an awesome comparison and those products you found look almost the same. 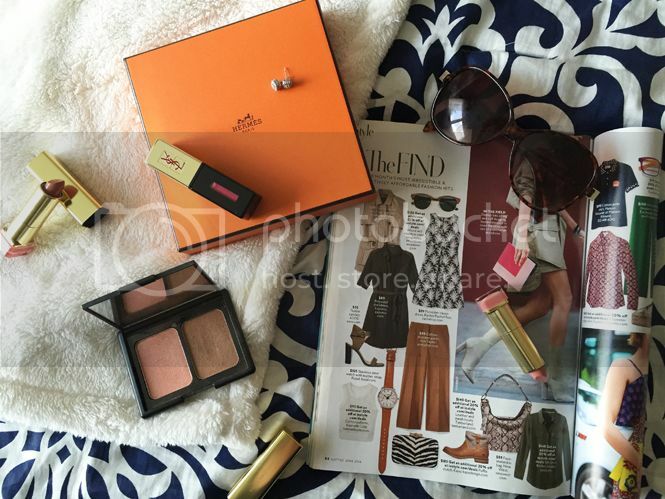 I loved all the products especially the mascara. I am going to buy the same outfit for my next beach vacay but in a pink color. One of my favorite color. Nice summer edition. Surely gonna have some of these. Thanks for sharing such an amazing and interesting post.